Remember at the end of last year when everyone was complaining about how awful 2016 was, and how they couldn’t wait for a new year and a fresh start? Surely 2017 couldn’t get any worse, right?!! Yeah . . . well, how did that turn out? I don’t want to get into the details here on the blog. After all, HonestlyYUM is a haaappy place, full of abundant cheese platters, stiff cocktails, and piles of sweets! Am I right? And yet again, here we are at the end of another year, and dare I say . . . 2018 couldn’t get any worse, right?!! 😛 Enough with the doom and gloom. Of course, there were plenty of 2017 highlights as well. As I’ve said before, it’s been such a treat to see Fiona turn from a sweet little toddler, into a full-blown threenager right in front of my very eyes. She’s already halfway done with her first year of preschool. She even has a little best friend who she coordinates her outfits with! Gah – the cutest thing ever! Anyway, before I get too carried away with the proud dad talk, I wanted to introduce you to a new member of the Honestly family . . . please welcome HonestlyFIT!! As we like to say, HonestlyFIT is HonestlyYUM and HonestlyWTF’s stronger sibling! Editor Orissa Rose provides her unique take on all things fitness and wellness related. Trust me, one visit will leave you fully inspired to live your very best, most active life. Case in point, this superfood salad!! 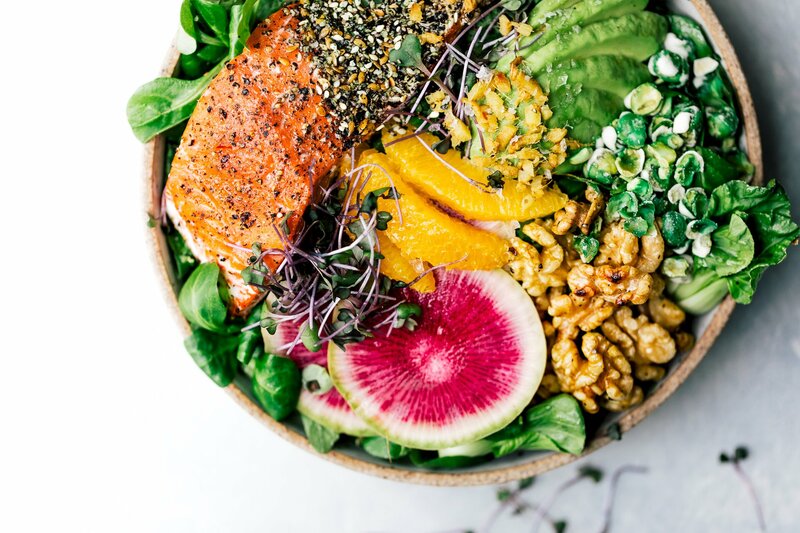 Orissa, being the generous woman that she is, whipped up this outrageously delicious salad, packed with an assortment of nutritious goodies (complete with her original creamy vegan cashew dressing) all to share with our readers here at HonestlyYUM! Just what I needed after all that heavy holiday binging. Stay tuned for more healthy inspo from HonestlyFIT in the coming weeks. And as always, thank you so much for stopping by the site this year, for all your kind words, and for making our little Honestly fam a part of your daily routine! Happy New Year!! 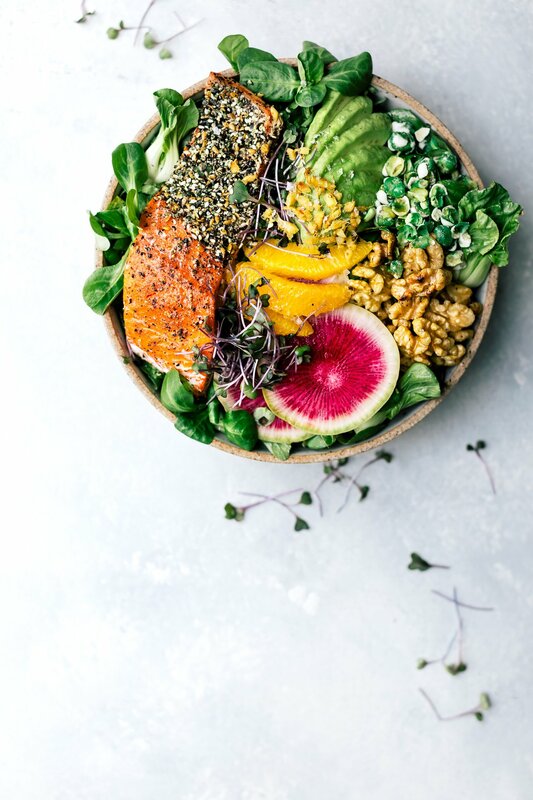 For a healthy start to the new year, give this scrumptious superfood salad a try!! Blend the nori sheets in a food processor. Add seeds, salt and sugar. Store in an airtight container. Submerge cashews in water and soak overnight, or for at least 4 hours. Drain cashews. In food processor or blender, blend cashews and oils until the consistency is creamy. Add lemon, pepper, maple syrup and wasabi paste. Mix again. Add the water - use more than our suggested amount for a slightly thinner dressing. You will have some remaining dressing. Store in the fridge and enjoy on other salads, roasted veggies or proteins throughout the week. Season the salmon with salt and pepper, and let sit to reach room temperature. Add a few drizzles of oil to a heavy skillet or pan over high heat until it shimmers. Place salmon in the pan with the skin side down and sprinkle chopped ginger throughout. Cook salmon uncovered until the color has changed about 75% through the fillet. Turn the heat down to medium, sprinkle lemon zest on top of the salmon and cover the pan for the final 1-2 minutes of cooking. Take off heat and set aside to cool. Place thin radish slices into a bowl with water and vinegar. Set aside. In a large bowl, toss the baby bok choy and watercress with the dressing and the walnuts. Divide the mixed greens into smaller serving bowls. 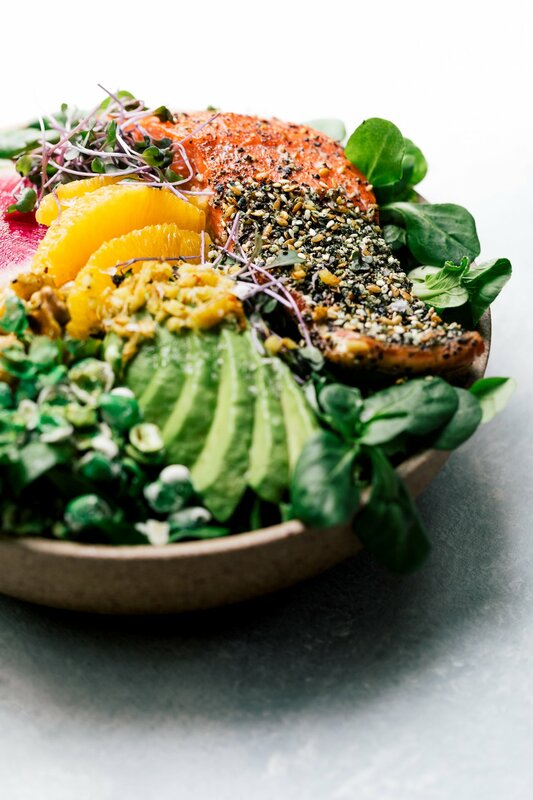 Sprinkle Fit Furikake onto salmon and place atop the mixed greens. Add sliced avocado, orange segments, micro greens, watermelon radish, and wasabi peas. Finish with black pepper and another drizzle of dressing, if desired. Allow at least 4 hours advanced preparation to make the cashew dressing.